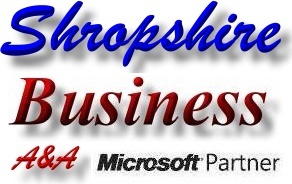 Shropshire office Fast Computer repair, low cost business computer support Shropshire. Welcome to Shropshire UK Office Computer Repair from A&A Computer Repair; not only serving Shropshire and Dudley, but providing Office Computer Repair throughout the Midlands and the UK. Please note that (at the timne of writing) we "look after" business computers from Ryton Eleven Towns through Market DRayton, Telford, Shrewsbury to Dudley, Bridgnorth to Oldbury. Please note; we do not use remote access systems as we feel that this can create security issues. We feel that visiting - working on site is far better.